Flappy Bird clones continue to dominate the iTunes app store. 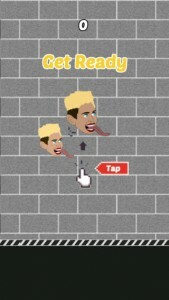 This week, Flappy Wings is the top free iPhone app followed by the the newest, Flying Cyrus, a parody game app that features the pop icon’s flapping tongue moving the Miley head through a maze of wrecking balls. The app is free to download and play, but there are a lot of ads.